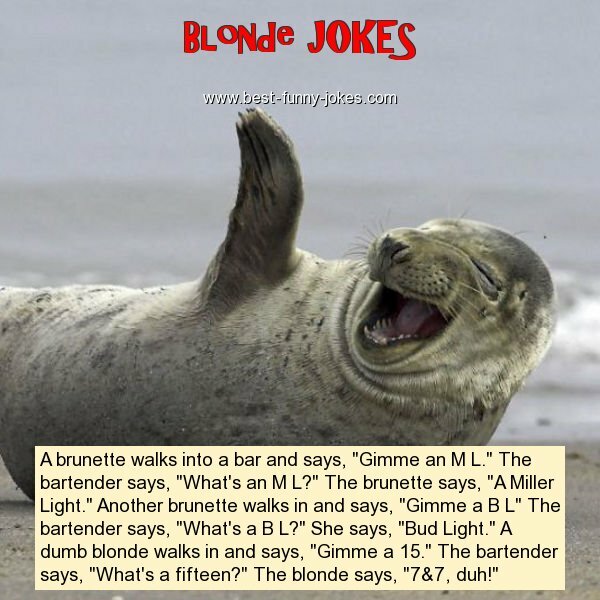 A brunette walks into a bar and says, "Gimme an M L." The bartender says, "What's an M L?" The brunette says, "A Miller Light." Another brunette walks in and says, "Gimme a B L" The bartender says, "What's a B L?" She says, "Bud Light." A dumb blonde walks in and says, "Gimme a 15." The bartender says, "What's a fifteen?" The blonde says, "7&7, duh!"